Thirteen students participated in RIT Upward Bound Classic’s first residential summer program. The students lived on RIT’s campus for five weeks, completing academic workshops in subjects like English and biology, sitting in on RIT courses, visiting other area colleges and speaking with community leaders about their career paths. 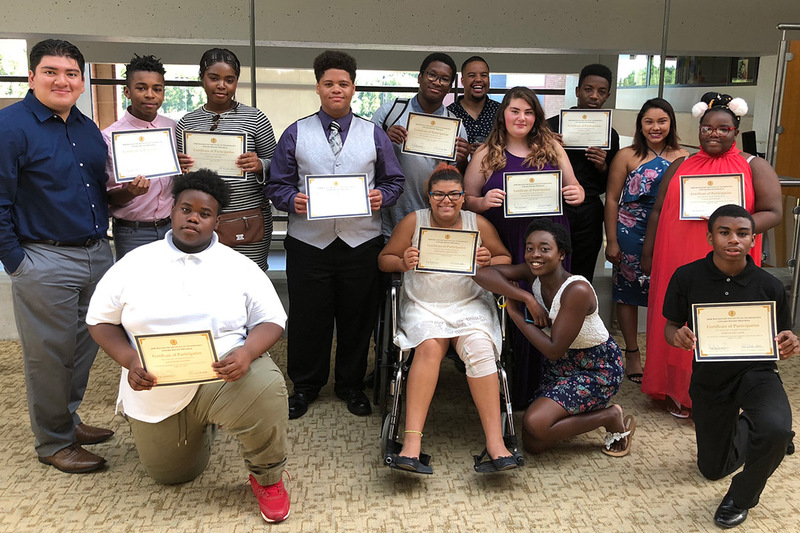 Rochester Institute of Technology’s Upward Bound Classic program wrapped up its first year with a residential summer program that provided Rochester-area high schoolers a taste of college. Thirteen students participating in the program lived on RIT’s campus for five weeks, completing academic workshops in subjects like English and biology, sitting in on RIT courses, visiting other area colleges and speaking with community leaders about their career paths. RIT’s Upward Bound Classic program launched last fall to help local first-generation and low-income students apply and gain admission to college. The program, funded by a five-year, $1.28 million grant through the Department of Education, serves 60 students annually from grades nine through 12 at the Leadership Academy for Young Men and Greece Olympia High School. The program aims to provide students who may not have much exposure to college a clear picture of what it entails and can provide. Joshua Lowe, a sophomore at Leadership Academy for Young Men who participated in the summer program, said it helped focus his vision for life after high school. Hayes said that in the school year ahead, the program hopes to offer Upward Bound Classic students more out-of-town visits to Ivy League schools and historically black colleges and universities. He also plans for the program’s academic workshops to tap into computer science more. To learn more about Upward Bound Classic, go to www.rit.edu/diversity/upward-bound.